Pride and Prejudice is the final production in the Guthrie's 50th anniversary season, and my tenth season as a subscriber. It's also the first repeated show in that 10 years (not counting the annual production of A Christmas Carol). Pride and Prejudice was the first production in my first season as a subscriber in the summer of 2003 (that has a nice symmetry to it, doesn't it?). It almost didn't work out that way - when the season was announced last year, the final show was Born Yesterday. 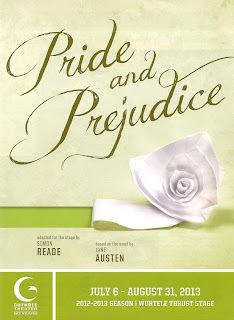 Earlier this year the decision was made to move that show to this winter, with Pride and Prejudice replacing it. Which I imagine caused a bit of a ruckus, getting all the required ducks in a row for this scale of a production on a shortened timeline, including a last-minute actor change. You wouldn't know it, as this is a gorgeous production, impeccably cast, and a charming rendition of a classic literary love story. Jane Austin's most popular novel centers on the Bennet family in early 19th century England - five daughters of marriageable age, an exasperated father, and a mother whose only goal is to see her daughters married and taken care of, since none of them can inherit their father's estate under English law. Wealthy gentlemen arrive in the country, and the Bennets are all aflutter. Balls, witty repartee, misunderstandings, scandals, and reconciliations continue for two hours, in a story I'm sure most of you are familiar with (if not - see Wiki). This adaptation by Simon Reade (a different one than they used 10 years ago) stays pretty faithful to the story as I remember it, condensing it nicely for the stage and keeping much of Austin's prose in the form of letters that are read by both the sender and recipient. The Guthrie has assembled an excellent cast of familiar faces and new, beginning with Ashley Rose Montondo as our heroine, the smart and spirited Elizabeth. Ashley was a last-minute replacement, stepping in just a month before previews began, and a fortunate one at that. She is so natural and charismatic as Lizzie; it's a star-making turn for someone with a relatively short bio (it's worth noting that Ashley, along with five other cast-members, is a product of the U of M/Guthrie BFA program). As her Darcy, Minnesota-actor-turned-TV-star Vincent Kartheiser* is initially stoic, disagreeable, and cold - as Darcy should be (he is the "pride" in Pride and Prejudice). But as he shows his softer side, Elizabeth warms to him, and so do we (it's lovely to see a natural smile on Vincent's face, something his Mad Men character never quite manages). They make quite a charming pair, and it's easy to root for and celebrate their happiness when it comes at long last. All of the Bennet sisters are perfectly cast, from Christine Weber as the eldest, the sweet and beautiful Jane, to Thallis Santesteban as the amusingly bookish Mary, to Aeysha Kinnenun, stealing scenes as the young and flighty Lydia. Completing the family, Mr. and Mrs. Bennet are played by the appropriately frazzled Peter Thomson and ridiculously silly Suzanne Warmanen. Kris Nelson is excellent as always as the quite creepy Mr. Collins (showing quite the range from his last role - the creepy-in-a-different-way Stanley Kowalski). Hugh Kennedy is charming as always as the good Mr. Bingley, and Anna Sundberg does haughty privilege well as his sister. Last but not least, Sally Wingert has a couple of nice turns as two completely different aunts - the girls' friendly aunt and Darcy's hilariously stern aunt. The set is dominated by a gorgeous and fascinating moving showpiece (set design by Alexander Dodge). The floor of the thrust stage is cut into concentric circles that rotate in opposite direction, the outer supporting a set of huge stately white columns, the inner a wall with three glass doors. As the circles spin in opposite directions, the set pieces are arranged in seemingly infinite combinations to represent various indoor and outdoor settings. The stairs around the familiar thrust stage are covered with green grass, with green topiary adorning the back of the stage. The only downfall of this relatively simple set is that it's difficult to see the difference between the Bennet's modest home and the more extravagant homes of the Darcys and Bingleys, but that's what the imagination is for. The costumes, hair, make-up, etc. are of course stunning; I expect no less at the Guthrie. Adding a little visual action to the drama, Joe Chvala has choreographed some charming English country dances. I was particularly impressed that Darcy and Elizabeth carry on a complete conversation while effortlessly performing the steps of an intricate dance. 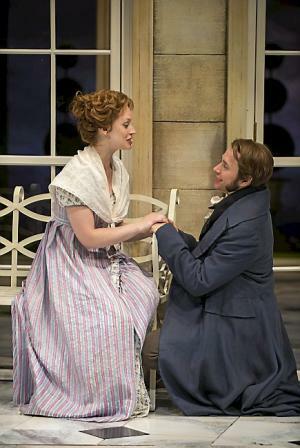 Pride and Prejudice is a great choice to close the Guthrie's landmark season. A classic and well-loved story; a cast that features Guthrie vets, new young local talent, and one of Minnesota's famous sons; and gorgeous production values. I found it to be quite charming. *I have to admit, when Vincent Kartheiser was announced as Mr. Darcy, I was very excited. You see, before I was a theater junkie, I was a TV junkie, and I still am. I believe Man Men to be the highest form of the art that television can be. And I love it when my fellow Minnesotans make it big on the national scene and then come home to share their gifts. I met Vincent a few weeks ago at the Guthrie's 50th Anniversary Gala and made a blithering idiot of myself, so in shock I was to see him live and in person instead of on my TV screen in 60s period garb. It took a minute to get used to him in a different role, but I saw no traces of Pete Campbell in Mr. Darcy. He's in a position of success where he has many choices before him, and the fact that he chose to do a play in his hometown is a pretty cool thing.